As a first for central London, streetlights connected to UK Power Networks electricity network in Kensington and Chelsea have been converted into charge points for electric vehicles. The trial by the Royal Borough of Kensington and Chelsea, UK Power Networks and Ubitricity started with the conversion of the first three Kensington street lights into Electric Vehicle (EV) charge points. This installation allows two local residents to charge their vehicles from a street light near their front door, and receive accurate bills for their electricity use via their smart phone or home PC. In the trial in Onslow Gardens, Kensington, drivers who previously charged their EV at a nearby shopping centre now park and plug in at one of the street lights that have been retro-fitted with charging technology. Access to the charge points is managed with smart charging cables. This way the amount of electricity being used can be accurately determined, so it can be paid for. The trial which started in November could pave the way for greater EV use and tackle air pollution in London by allowing drivers to conveniently charge their vehicles closer to home over-night. In outer London, 33% of households have no access to off-street parking to charge an EV, and in inner London this rises to 46%. Councillor Tim Coleridge, the Royal Borough’s Cabinet Member for Highways, said: “A growing number of residents have made enquiries about the availability of electric vehicle charging points here in Kensington and Chelsea. Mark Burton, from UK Power Networks, said: “We are delighted to work with the Royal Borough and Ubitricity on a trial to allow more EVs to charge via street lighting columns connected to our network. This technology avoids the need to build new electricity network and makes better use of the cables, particularly in the daytime when the lights are switched off. “This solution means we can monitor how much electricity is being used in order to maintain reliable electricity supplies as more EVs connect to our networks. It should also release more parking spaces currently set aside as dedicated EV charging bays, result in less street furniture and fewer excavations to install new charging points. UK Power Networks agreed to upgraded fuses at the first three points to allow more electricity to be safely drawn from the cable, making sure local electricity supplies remain safe and reliable. 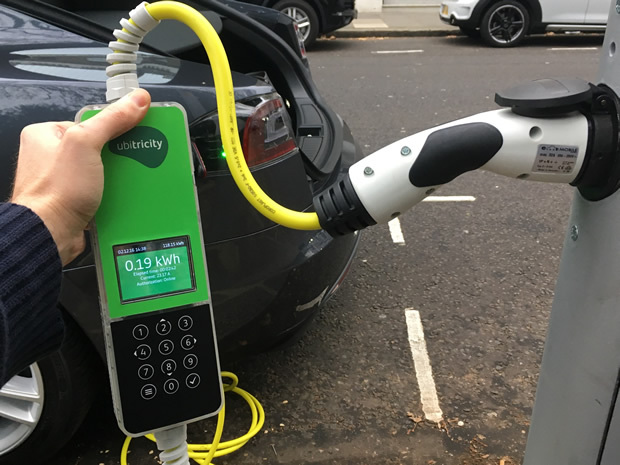 Knut Hechtfischer, founder of Ubitricity, said: “UK Power Networks has been very supportive and helpful in facilitating some of the very first London based trials of Ubitricity’s unique and innovative EV charging technology. Utilising existing street lighting assets to provide low power residential smart charging is a key component of any council’s residential on-street EV charging solution. Turning an existing street light into a charge point can be done in an hour or even less. In December the Department for Transport’s On Street Residential Grant Scheme (£2.5m) launched guidance for Local Authorities UK-wide to apply for funding for provision of charge points in residential areas, where there is a lack of off-street parking.